Entrance / hall with floor tiling and staircase to the 1st floor. Fuse box. Light tiled bathroom with closet and fountain. Bright, Z-shaped living / dining room with laminate flooring, large storage cupboard, tightly plastered walls and plenty of light through the large windows. Separate kitchen with floor tiling and door to the backyard. Light and modern kitchen design in L-shape (2014) with worktop with sink, built-in cooking plate (4-burner / gas), extractor hood, microwave, dishwasher, fridge / freezer (for acquisition) and various drawers and cabinets. Landing with laminate flooring, tightly plastered walls, built-in cupboard and stairs to the 2nd floor. Light tiled bathroom with shower, 2nd toilet, modern sink, designer radiator and built-in lighting. Located at the front, spacious bedroom 1 with tightly plastered walls, laminate flooring and built-in lighting. Located at the rear, spacious bedroom 2 with tight plastered walls and laminate flooring. Bedroom 3 located at the rear with tight plastered walls and laminate flooring. Via fixed staircase to reach second floor. Foreman with laminate flooring, Velux roof window, tightly plastered walls and storage space. Very neat laundry / boiler room with floor tiling, sink, Velux roof window, central heating combi boiler and connection for washing equipment. Spacious bedroom 4 with laminate flooring, two Velux roof windows, built-in lighting and closable storage areas in the sloping roof. Deep, secluded backyard on the southwest with rear, ornamental paving, lawn, outdoor lighting, outside tap and various vegetation and planting. Stone storage with electricity. 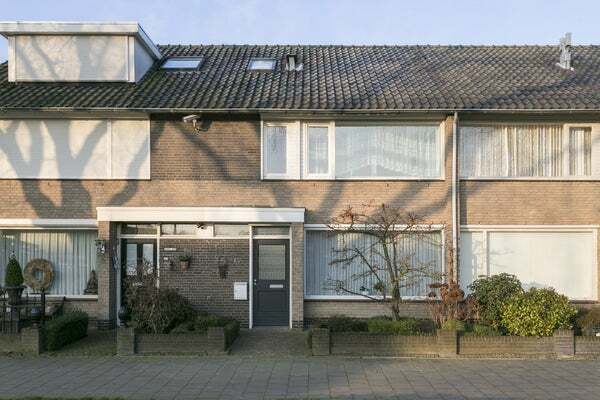 The property is located on a green park near the Henri Dunant Park and all other desired amenities, such as shops (Woenselse Heide shopping mall and Woensxl shopping center), schools, sports facilities, Catharina hospital, Eindhoven Airport and roads to A2, A50, A58 and N2. • The house is largely equipped with electric shutters. • The entire house has beautiful panel doors. • The house has double glazing and roof insulation.